Travertine forms from geothermal springs and is often linked to siliceous systems that form siliceous sinter. Macrophytes, bryophytes, algae,cyanobacteria, and other organisms often colonise the surface of travertine and are preserved, giving travertine its distinctive porosity. Some springs have temperatures high enough to exclude macrophytes and bryophytes from the deposits. As a consequence, deposits are, in general, less porous than tufa. Thermophilic microbes are important in these environments and stromatolitic fabrics are common. When it is apparent that deposits are devoid of any biological component, they are often referred to as calcareous sinter. Modern travertine is formed from geothermally heated supersaturated alkaline waters, with raised pCO2 (see partial pressure). On emergence, waters degas CO2 due to the lower atmospheric pCO2, resulting in an increase in pH. Since carbonate solubility decreases with increased pH, precipitation is induced. Precipitation may be enhanced by factors leading to a reduction in pCO2, for example increased air-water interactions at waterfalls may be important, as may photosynthesis. Precipitation may also be enhanced by evaporation in some springs. Both calcite and aragonite are found in hot spring travertines; aragonite is preferentially precipitated when temperatures are hot, while calcite dominates when temperatures are cooler. When pure and fine, travertine is white, but often it is brown to yellow due to impurities. 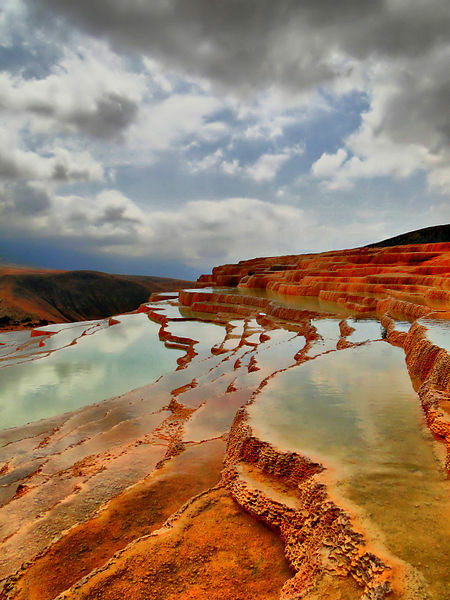 Travertine may precipitate out directly onto rock and other inert materials as in Pamukkale or Yellowstone for example.